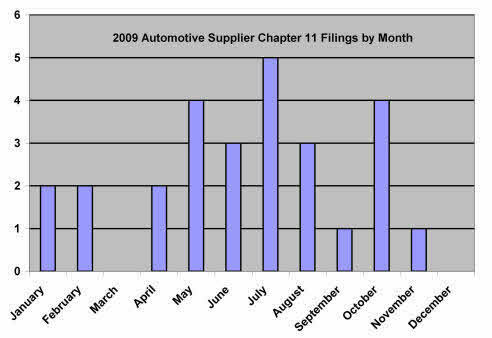 The bankruptcy case of Global Safety Textiles Holdings LLC (“Global Safety” and, together with the affiliates who filed with it, the “Debtors”) illustrates a growing risk for US automotive suppliers and OEMs – the potential failure of an international supply chain due to strict European insolvency laws. Global Safety Textiles Holdings LLC (“Global Safety” and, together with 8 domestic and international debtor subsidiaries, the “Debtors”) has filed a consolidated list of the 30 largest unsecured creditors of the Debtors (the “Top Unsecured Creditor List”). This list is remarkable for the small size of the supplier pre-petition claims. The reasons for this phenomenon are explained in detail in the later post discussing certain substantive aspects of this case. Global Safety Textiles Holdings LLC (“Global Safety” and, together with 8 domestic and international debtor subsidiaries, the “Debtors”) filed bankruptcy on June 30, 2009 in the Bankruptcy Court for the District of Delaware (lead case no. : 09-12234). The Debtors are part of International Textiles Group, Inc.’s (“ITG”) automotive safety group. As discussed in detail in a subsequent post, this bankruptcy case is about the non-debtor affiliates of the Debtors – so this post identifies both the Debtors and the foreign affiliated operating non-debtors.